The Arts Advocacy Through Action page highlights community service projects by UMTA chapters and members. Several years ago Heather Smith NCTM, saw a need in her community for an adequate piano recital space. As a Change Leader through the Utah Division of Arts and Museums, Heather developed a project in the Bountiful, Utah. In the middle of renovation on Main Street, the Bountiful Davis Arts Center (BDAC) served as a wonderful collaborator open to providing the space for a performance stage and two Steinway Baby Grand Pianos in an effort to support music education and performances by local teachers and musicians. 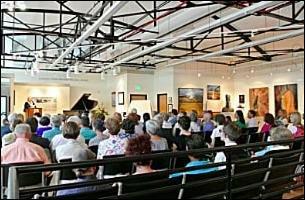 To make the vision of a recital space with two baby grand pianos a reality, the project included planning with BDAC, city officials, participation by several Davis Chapter and Salt Lake Chapter teachers and their students in an 88-Hour Piano-a-thon in May 2015, dedication recitals and ribbon cutting ceremonies. Heather Smith, NCTM, states, “Leadership is a conscious choice. To be an advocate for the arts in your community, you do not need to belong to an organization or hold an official leadership position. You can make a positive and lasting impact by finding a need and filling it." 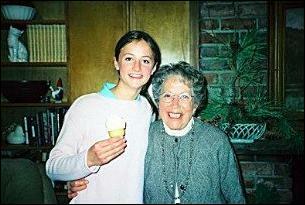 Edith Reed has taught hundreds of students over many decades. She has been an active member of the Utah Music Teachers Association and the Utah Federation of Music Clubs, serving as festivals chair for the UFMC piano festival for many years until it was felt that it could no longer be done without using computers. The hours spent sorting applications and scheduling the festivals cannot be counted. Edith has taught children in her local church congregation free of charge for many years, inspiring many to serve in musical positions in church. In the UMTA she has been an example to many other teachers of dedication and quality work with students. The quality of performance she has elicited from her students, and the careful attention to the feelings and overall well-being of students meets the highest standards. Her example through the performance of her students in festivals, recitals and other performances has helped to raise the bar for others, inspiring us to achieve excellence in our own studios. Over the past 29 years, students and teachers of the Sandy Chapter (MTA) have participated in monster concerts and benefit events. Since 1990, the Sandy Chapter presents a Monster Concert that on average involves over 425 students, their dedicated teachers, and 5-8 pianos. It provides students to learn duet playing and performing in the community. 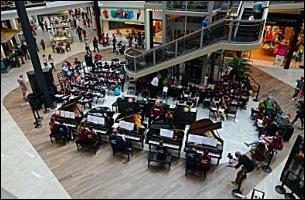 Through the Sandy UMTA, Sandra Peterson and Marie Harris organize large-scale performances in local malls involving eight pianos for benefiting cystic fibrosis, leukemia and muscular dystrophy. Participants raised significant funding for these causes through their music. In 2000, they received a grant from the Music Teachers National Association (MTNA) for their community effort. The concert provides a chance for students to be involved in an event with all the energy and excitement of a Broadway show. In May 2017, students and studios as far as Park City, Utah joined in performing at the South Towne Mall in Sandy, Utah.